THE SON OF MAN HAS COME TO SEEK AND SAVE WHAT WAS LOST. This Sunday's readings remind us of the unfathomable love God has for us. Our first reading from the Book of Wisdom (11:22-12:2) is a beautiful description of our awesome God who's gentle but persistent love guides us back to him, little by little. Before the LORD the whole universe is as a grain from a balance or a drop of morning dew come down upon the earth. But you have mercy on all, because you can do all things; and you overlook people's sins that they may repent. For you love all things that are and loathe nothing that you have made; for what you hated, you would not have fashioned. And how could a thing remain, unless you willed it; or be preserved, had it not been called forth by you? But you spare all things, because they are yours, O LORD and lover of souls, for your imperishable spirit is in all things! Therefore you rebuke offenders little by little, warn them and remind them of the sins they are committing, that they may abandon their wickedness and believe in you, O LORD! 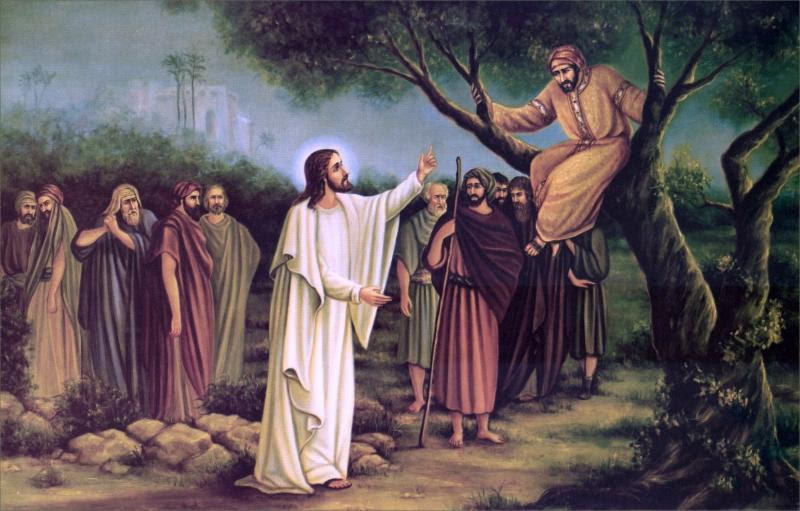 Our Gospel reading (Luke 19:1-10) is another clear example of Jesus' persistent effort to go after those who have lost their way and bring them back, ever so gently. This time, with a wealthy tax collector, who responds positively to Jesus' invitation. Our Epistle reading is from St.Paul's second letter to the Thessalonians (1:11-2:2). The first part is a prayer from St. Paul for their continued fulfillment of God's promise in them. The second part is an instruction not to be distracted by false "spirits". Brothers and sisters: We always pray for you, that our God may make you worthy of his calling and powerfully bring to fulfillment every good purpose and every effort of faith, that the name of our Lord Jesus may be glorified in you, and you in him, in accord with the grace of our God and Lord Jesus Christ. Even though our entire universe is but a "drop of morning dew", God loves each one of us with such an "imperishable spirit" and will ever seek to find us on our wayward paths and guide us back to him. May the Lord be glorified in us.